Kauvar, David S. Dubick, Michael A. Walters, Thomas J. and Kragh, John F. 2018. Systematic review of prehospital tourniquet use in civilian limb trauma. Journal of Trauma and Acute Care Surgery, Vol. 84, Issue. 5, p. 819. Miller, Erin A. Iannuzzi, Nicholas P. and Kennedy, Stephen A. 2018. Management of the Mangled Upper Extremity. JBJS Reviews, Vol. 6, Issue. 4, p. e11. Kragh, John F. and Dubick, Michael A. 2017. Bleeding Control With Limb Tourniquet Use in the Wilderness Setting: Review of Science. Wilderness & Environmental Medicine, Vol. 28, Issue. 2, p. S25. Kragh, John F. and Dubick, Michael A. 2016. Skill decay or maintenance between tourniquet uses among first aid caregivers: Exploration in a manikin model. The American Journal of Emergency Medicine, Vol. 34, Issue. 9, p. 1897. † Department of Surgery, Trauma Program, McGill University Health Centre, Montreal, QC. CM, BB, KK and JN participated in writing and review of the final manuscript. CM takes responsibility for the paper as a whole. 1. Kragh, JF Jr, Beebe, DF, O’Neill, ML, et al. Performance improvement in emergency tourniquet use during the Baghdad surge. Am J Emerg Med 2013;31(5):873-875, doi: 10.1016/j.ajem.2012.11.030. PMID: 23481155. 2. King, DR, van der Wilden, G, Kragh, JF Jr, et al. Forward assessment of 79 prehospital battlefield tourniquets used in the current war. J Spec Oper Med 2012;12(4):33-38. PMID: 23536455. 3. Kragh, JF Jr, Littrel, ML, Jones, JA, et al. Battle casualty survival with emergency tourniquet use to stop limb bleeding. J Emerg Med 2011;41(6):590-597. 4. Kragh, JF Jr, O’Neill, ML, Walters, TJ, et al. 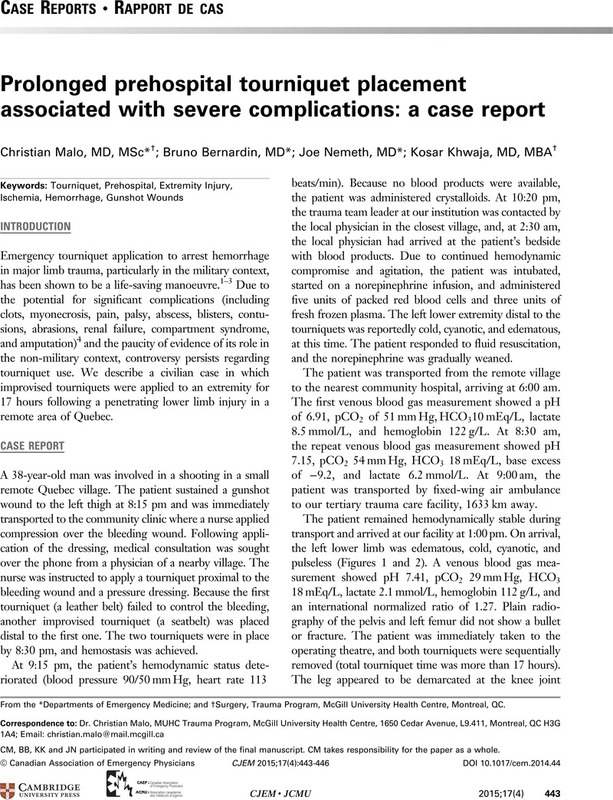 Minor morbidity with emergency tourniquet use to stop bleeding in severe limb trauma: research, history, and reconciling advocates and abolitionists. Mil Med 2011;176(7):817-823. PMID: 22128725. 5. Fludger, S, Bell, A. Tourniquet application in a rural Queensland HEMS environment. Air Med J 2009;28(6):291-293, doi: 10.1016/j.amj.2009.06.002. PMID: 19896580. 6. Mullins, J, Harrahill, M. Use of a tourniquet after a gunshot wound to the thigh. J Emerg Nurs 2009;35(3):265-267, doi: 10.1016/j.jen.2009.01.008. PMID: 19446140. 7. Sims, C, Polk, T. Rollover car crash almost costs driver his life, limb. J Emerg Med Serv 2012;37(9):30-31. PMID: 23342696. 8. Beekley, AC, Sebesta, JA, Blackbourne, LH, et al. Prehospital tourniquet use in Operation Iraqi Freedom: effect on hemorrhage control and outcomes. J Trauma 2008;64(2 Suppl):S28-S37; discussion S37, doi: 10.1097/TA.0b013e318160937e. 9. Lairet, JR, Bebarta, VS, Burns, CJ, et al. Prehospital interventions performed in a combat zone: a prospective multicenter study of 1,003 combat wounded. J Trauma Acute Care Surg 2012;73(2 Suppl 1):S38-S42. PMID: 22847092. 10. Fox, N, Rajani, RR, Bokhari, F, et al. Evaluation and management of penetrating lower extremity arterial trauma: an Eastern Association for the Surgery of Trauma practice management guideline. J Trauma Acute Care Surg 2012;73(5):S315-S320. PMID: 23114487, doi: 10.1097/TA.0b013e31827018e4. 11 American College of Surgeons Committee on Trauma. Advanced trauma life support (ATLS): ninth edition. J Trauma Acute Care Surg 2013; 74(5):1363-6. PMID: 23609291. doi: 10.1097/TA.0b013e31828b82f5. 12. Bulger, ME, Snyder, D, Schoelles, K, et al. An evidence-based prehospital guideline for external hemorrhage control: American College of Surgeons Committee on Trauma. Prehosp Emerg Care 2014;18:163-173. PMID: 24641269, doi: 10.3109/10903127.2014.896962. 13. Doyle, GS, Taillac, PP. Tourniquets: a review of current use with proposals for expanded prehospital use. Prehosp Emerg Care 2008;12:241-256. PMID: 18379924, doi: 10.1080/10903120801907570. 14. Wakai, A, Winter, DC, Street, JT, et al. Pneumatic tourniquets in extremity surgery. J Am Acad Orthop Surg 2001;9:345-351. PMID: 11575914. 15. Lee, C, Porter, KM, Hodgetts, TJ. Tourniquet use in the civilian prehospital setting. Emerg Med J 2007;24:584-587. PMID: 17652690, doi: 10.1136/emj.2007.046359. 16. Kragh, JF Jr, Walters, TJ, Baer, DG, et al. Survival with emergency tourniquet use to stop bleeding in major limb trauma. Ann Surg 2009;249(1):1-7. PMID: 19106667, doi: 10.1097/SLA.0b013e31818842ba. 17. Tien, HC, Jung, V, Rizoli, SB, et al. An evaluation of tactical combat casualty care interventions in a combat environment. J Am Coll Surg 2008;207(2):174-178. PMID: 18656043, doi: 10.1016/j.jamcollsurg.2008.01.065. 18. Wolf, LH, Adkins, TF. Tourniquet problems in war injuries. Bull U S Army Med Dep 1945;87:77-84. 19. Kragh, JF Jr, Baer, DG, Walters, TJ. Extended (16-hour) tourniquet application after combat wounds: a case report and review of the current literature. J Orthop Trauma 2007;21(4):274-278. PMID: 17414556.